Who can resist the allure of a crisp, delicious apple? If you are in USDA zones 3-8, you have a climate that can sustain apple trees, which means you can grow your own. 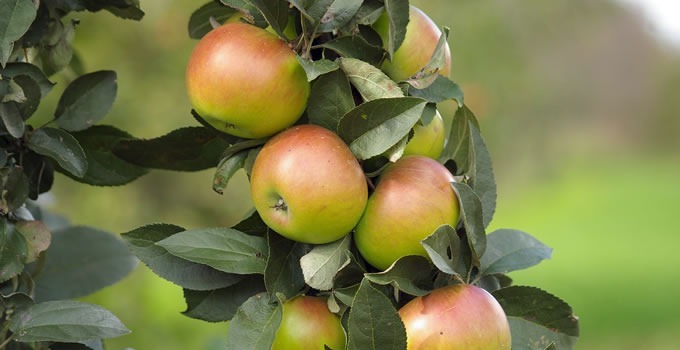 You might think that you don’t have the space to grow your own apple trees, but with modern dwarf varieties it is possible to grow apple trees nearly anywhere even when space is at a premium. Whether you choose a standard or dwarf size tree, the basic needs are the same. The magic formula for healthy, happy and productive apple trees is rich, loamy and pH neutral soil and full sun exposure of at least 6 hours per day. One note about dwarf apple trees: they are notorious for uprooting when they become top heavy under the weight of a full crop. This can be easily handled by situating the tree near to a trellis or fence that can help to support the weight when necessary. Cross-pollination is the key to apple production. While that usually means that you need at least two trees of different varieties, with apples you can accomplish the same results in smaller spaces that can’t house more than a single tree by grafting a branch from a second apple variety onto your existing tree. Apple trees can be quite prone to problems with pests, most of which can be managed without too much trouble. Deer are rarely an issue in the urban garden, but if they are in your area, you may need some sort of repellant or protective fencing to keep them at bay. A more likely problem will be apple maggots which are a pain but can be easily thwarted by painting a couple of apple-sized balls red and coating them with a sticky substance (think fly trap, for apple maggots). Keeping your apple trees pruned annually (when dormant, please!) will let the leaves and branches breathe and help to keep pests and disease at bay.